Hi everyone! I hope you all have had a wonderful Summer! Where I live, we are finally experiencing some cooler weather, which makes me look forward to Fall, and with that comes my favorite holiday, Halloween!! Gypsy Soul Laser Cuts has a wonderful selection of Halloween chippies, as well as chippies that can be used together with Halloween. 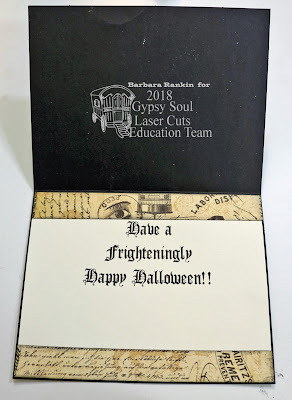 Today, I want to share a fast and easy card that can be enlarged to make a scrapbook layout or art journal page, or even a home decor canvas to display for your next Halloween gathering. 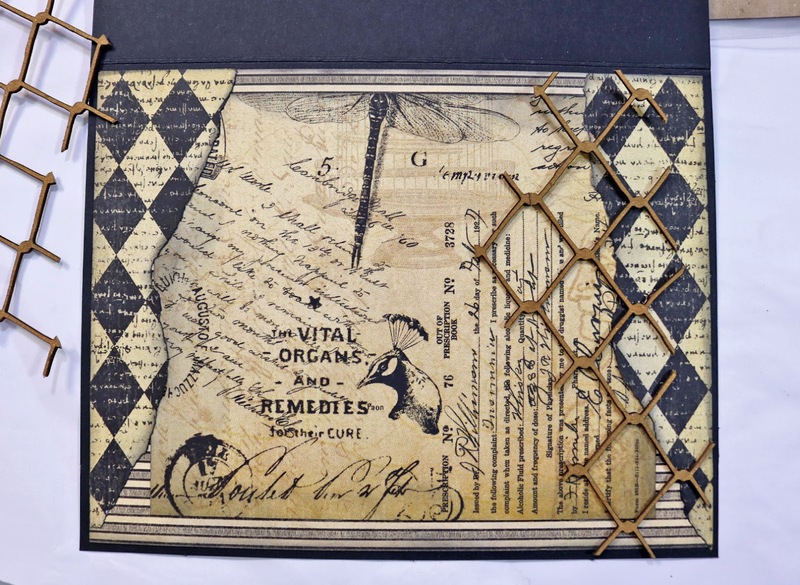 Make a black card base to measure 5" x 6-1/2" when folded in half. Cut a piece of black stripe paper just slightly smaller than the card front and adhere. 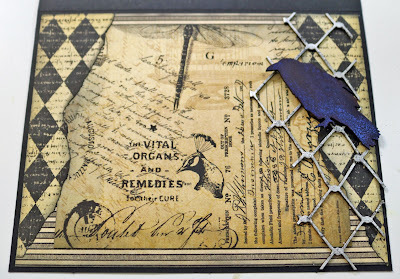 Center and adhere a scrap of oddities print paper. 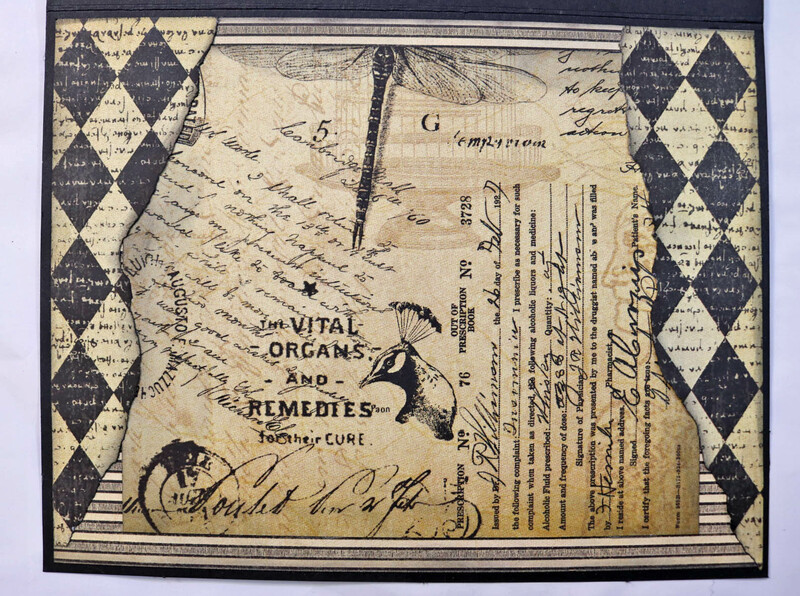 Tear scraps of harlequin paper to fit along edges of card, adhere as shown. 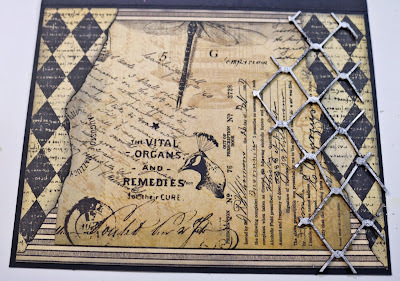 Cut a piece of the Chainlink panel to fit on front edge of card, as shown. 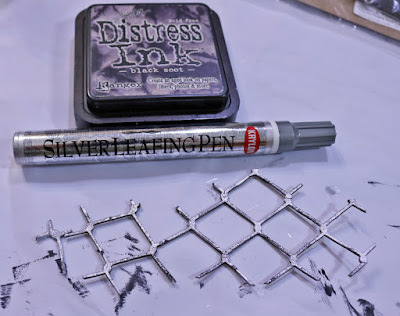 Color chainlink with silver leafing pen and let dry. Then swipe black soot distress ink pad over chainlink to get an aged look. 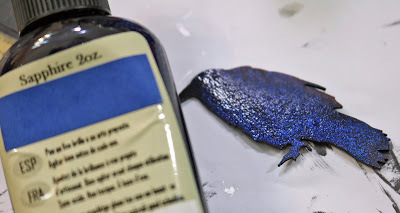 Paint black bird with black acrylic paint, let dry. 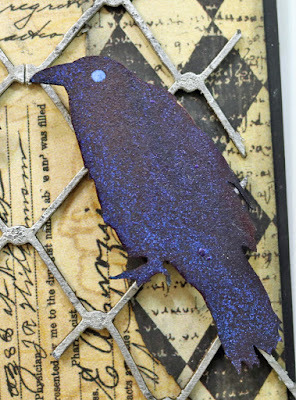 Spray bird with Sapphire Tattered Angels mist, let dry. 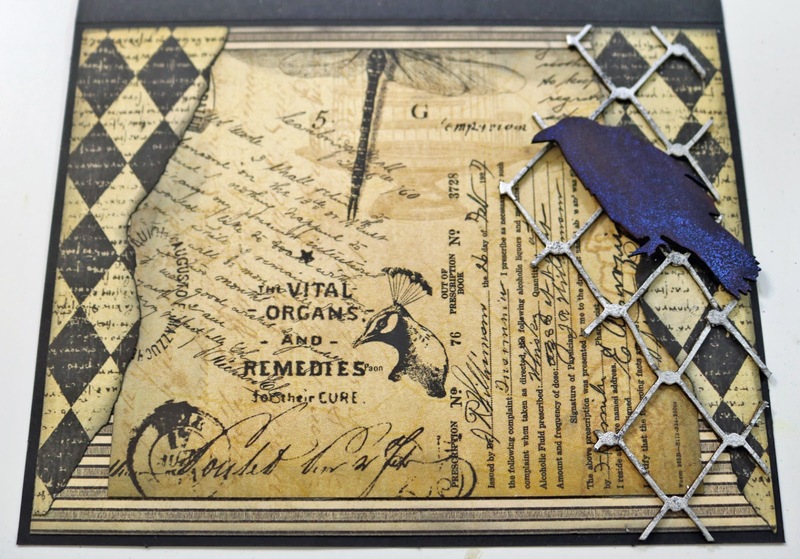 Adhere black bird with foam dot to front of card over chainlink, as shown. Add white dot for eye with gel pen. I later added a black dot to make more realistic. 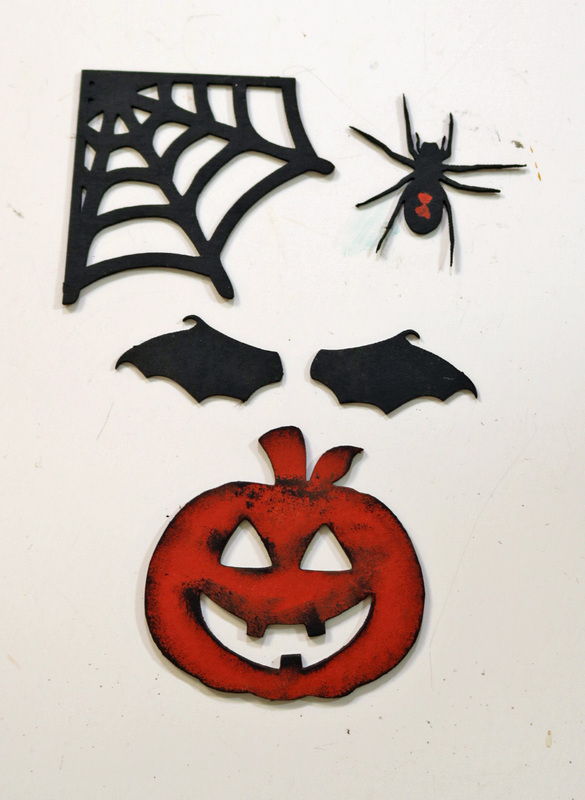 Paint middle size Bat Wings Miniatures and corner web with spider with black acrylic paint, let dry. Paint pumpkin with orange acrylic paint, and use same color to add an hourglass image to body of spider. Edge pumpkin with black acrylic paint to add a spooky look. 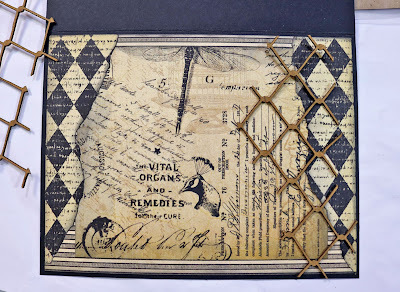 Color paper doll with frayed burlap distress ink and add to front of card with foam dots. Add miniature bat wings behind the image. Paint bat wings with Sea Kelp glimmer glaze paint. Glue spider web corner to upper left corner. 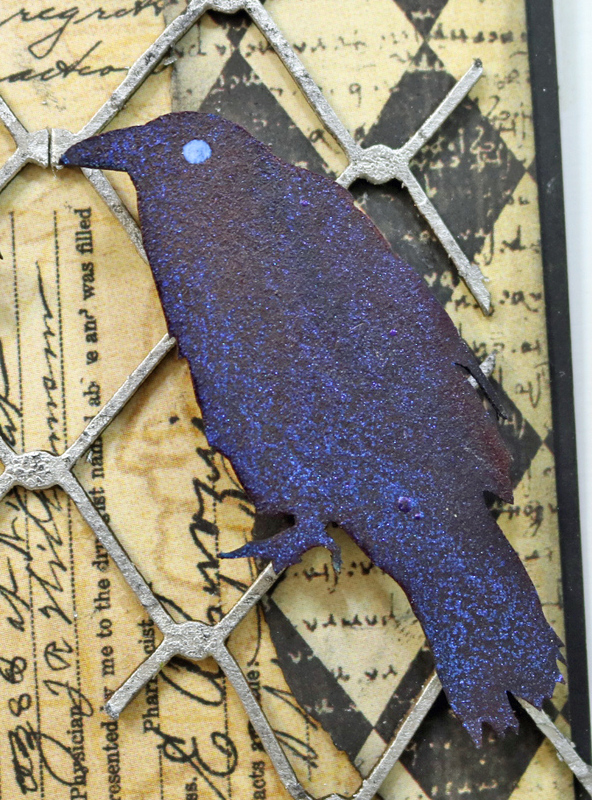 Add green Stickles glitter glue over web. Adhere spider over web with foam dot. 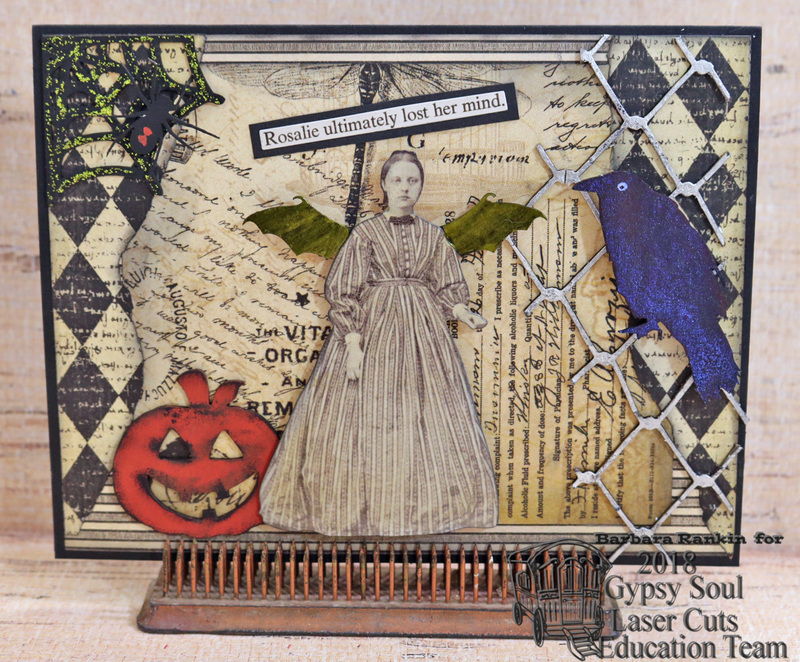 Glue pumpkin to card beneath dress of paper doll, as shown. 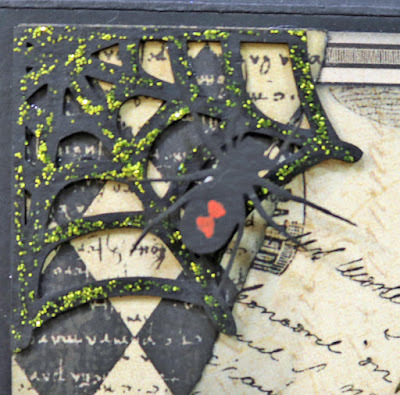 Choose a Halloween clippings sticker, adhere to a scrap piece of black paper, cut a small border around it and adhere to card front. as shown. Computer generate "HAPPY HALLOWEEN" and print onto cream paper for inside of card. 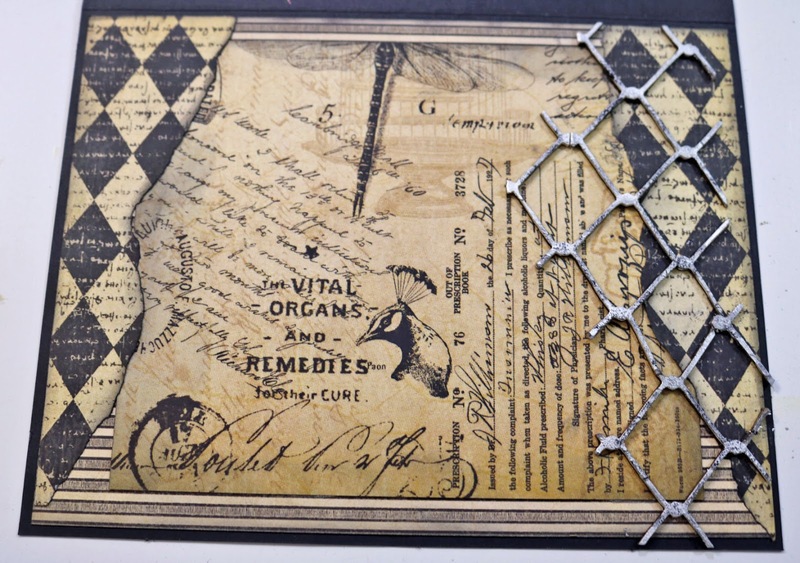 Use scraps of the same paper used on the card front to bring it all together. 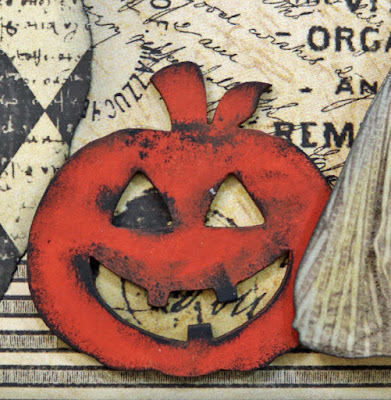 I hope you enjoyed my card tutorial today and that perhaps I've inspired you to get busy making some fun Halloween cards or projects, too. 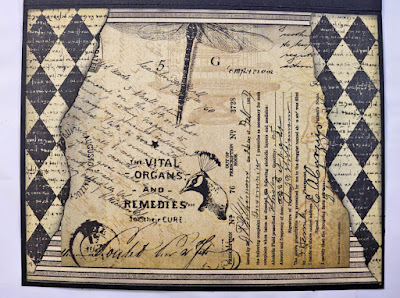 I really like your card with all the different details!! Halloween is my favorite holiday!! Thanks so much, Jon. It is my favorite holiday, too!